Alzheimer disease is the main cause of dementia. Patient who suffer from alzheimer disease may also complain of certain neurological deficit such as aphasia, loss of motor function or visuospatial dysregulation as well as disorientation. Patient may also develop incontinence. Alzheimer disease may are caused by atrophy of the nucleus basalis of meynert. This may be accompanied by the evidence of atrophy of the brain cortex with widening of the ventricles and the sulci. Alzheimer disease is also associated with the decreased in the level of acetylcholine due to deficiency of the choline acetyltransferase. This condition lead to the introduction of donepezil which is an acetylcholinesterase inhibitor to inhibit the action of acetyl choline transferase ezyme from breaking down the choline acetyltransferase molecule. Alzheimer disease may also caused by abnormal expression of the amyloid gene which later lead to increase in production of amyloid beta protein. In this case, neuritic plaques will be detected. The neuritic plaque is a spherical cluster with peripheral astrocytes and amyloid beta protein core. This abnormal expression of amyloid gene is associated with familial form of Alzheimer disease which lead to mutation on the chromosome 21 which coded for the amyloid precursor protein gene. Other form of mutation is also associated with familial Alzheimer disease such as mutation the chromosome 1, 14 which coded for presenilin genes and the mutation of the chromosome 19 for apolipoprotein E4. Pathologically Alzheimer disease is associated with the present of neurofibrillary tangles which consists of tau protein. The neurofibrillary tangle may displace the nucleus. There will also be eosinophilic bodies in the hippocampal cells which are known as Hirano bodies. 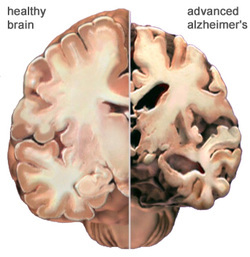 Alzheimer disease has no cure and it is a progressive type of disease. 1.Whitehouse, Peter J., Donald L. Price, Arthur W. Clark, Joseph T. Coyle, and Mahlon R. DeLong. “Alzheimer Disease: Evidence for Selective Loss of Cholinergic Neurons in the Nucleus Basalis.” Annals of Neurology 10, no. 2 (1981): 122–126. doi:10.1002/ana.410100203. 2.Hirano, A. “Hirano Bodies and Related Neuronal Inclusions.” Neuropathology and Applied Neurobiology 20, no. 1 (1994): 3–11. doi:10.1111/j.1365-2990.1994.tb00951.x. 3.Harman, Denham. “Alzheimer’s Disease Pathogenesis.” Annals of the New York Academy of Sciences 1067, no. 1 (2006): 454–460. doi:10.1196/annals.1354.065.